Donna was involved in two motor vehicle accidents nine years apart. Both incidents contributed to significant upper neck and back injuries and frequent migraine headaches. In the past, Donna worked as a part-time Medical Office Assistant, where being on the phone and typing simultaneously was a painful task. Repetition, ill-fitting chairs, or static posture would intensify her pain. “My days off were often spent incapacitated with stress-induced headaches. Life being like a ‘yo-yo’ forced me to accept the problems of being employed,” she says. Donna met a staff member from the Neil Squire Society at a function for the Canadian National Institute for the Blind, where she volunteers. The staff member told Donna about the supports that were available through the Technology@Work program. The Neil Squire Society operates the Province of British Columbia’s Technology@Work program that provides people with disabilities access to assistive technologies they need for employment, often at no cost to the client. Once she applied to the program, Donna was assessed by Technology@Work occupational therapists. In addition to her volunteer position, Donna works from home as a general or medical transcriptionist. She converts speech into text from digital audio recordings of one-on-one interviews or focus groups for research projects at various universities. 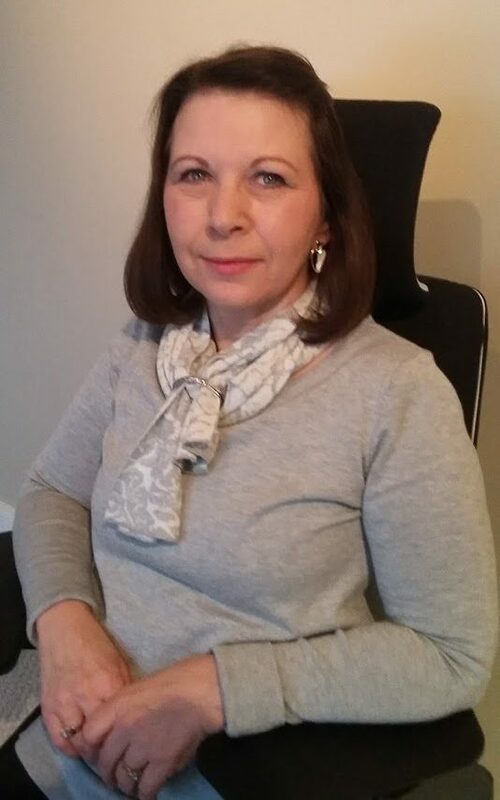 Through the Technology@Work program, Donna received a variety of ergonomically assistive devices to help her out at work, including: an adjustable office chair, an ergonomic keyboard, an adjustable keyboard tray, an adjustable ambidextrous clamshell mouse, and a monitor arm. Prior to receiving this ergonomic equipment, Donna had been hesitant in transcribing focus groups for clients, instead only accepting one-on-one interview transcription contracts. She frequently turned job opportunities away as she described this nature of work to be “so intense it causes too much pain”. Focus group transcription involves significant concentration and static posture. Donna “highly” recommends the Technology@Work program, and adds: “I am so grateful to the Neil Squire Society for being such a positive support for me. I’m very happy to have met the awesome team players within this organization. They have all been very helpful, caring, and understanding of my situation amid their professionalism, knowledge, and over-the-top friendliness.